Boxers are energetic and highly intelligent dogs. They strive for attention and love to please their owners. Although Boxers are quick learners, they tend to be stubborn when they do not want to do something. 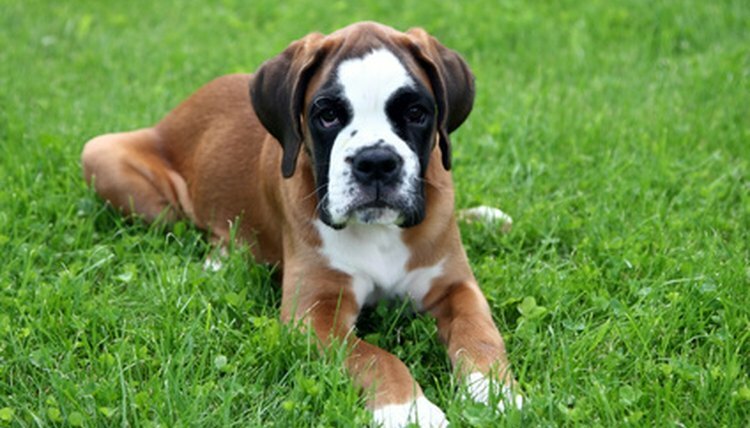 It is important to train Boxer puppies at an early age, as they can become hard to train and control. One of this first things you should do when you get your Boxer puppy home is to potty train it. Begin potty training when the Boxer puppies are at least 7 weeks old as they are now able to walk and learn. Make sure to start training as soon as possible. If you start potty training when the puppies are over 12 weeks of age, it will be more difficult for them to learn. They will have developed bad habits that will be hard to break. Choose a location in your yard where the Boxer puppy will go to the bathroom each time he goes outside. Always take the puppy to this one location when it is time to go potty. Do not confuse the puppy by taking him to a new location each time. Say to the Boxer puppy, “let’s go potty.” Put the dog collar on the puppy and attach the leash to the collar. Use the leash to lead the puppy to the location that you had chosen in Step 2. Stay in this area until the puppy has gone potty. Praise the puppy immediately by saying “good job” and give him a dog treat. Reward the puppy in this manner every time he has finished going to the bathroom. Create a consistent routine. Take the Boxer puppy outside to use the bathroom at the same times everyday. The puppy will need to go to the bathroom after waking up from a night’s sleep, after playing for a long time, after eating, after drinking and before bedtime. Putting the Boxer puppy on a regular feeding schedule will help you predict when the puppy needs to go potty. Repeat this process until the Boxer puppy is no longer going to the bathroom in the house. If you have a fenced-in yard, the puppy should be able to go to the bathroom on his own without a leash. This can take several weeks or more to accomplish. It is important that you stay consistent with your training. Apply these steps in the exact same manner each time. Your puppy will learn much faster because puppies learn by repetition. If you do or say something different each time you take your puppy out to potty, you will confuse him. Watch for signs from your puppy that he needs to go to the bathroom. If your puppy is sniffing around, circling, whimpering or scratching at the door, he probably needs to go out. It is recommended that you purchase a dog crate if you cannot supervise your Boxer at all times. Make sure you purchase a large enough crate to accommodate your Boxer. You will need to crate train your puppy to ensure that he will not go to the bathroom throughout your home. Never yell at, hit or rub your puppy’s nose in the carpet when he has had an accident. This does nothing to help your puppy learn faster. Punishing will only make the puppy afraid of you. Instead, ignore your puppy when he has an accident and clean the mess up right away. Be patient and keep rewarding your Boxer puppy whenever he goes to the bathroom outside. Based in Ohio, Patricia Arnett has been a professional freelance writer since August 2009. She is knowledgeable in a wide range of fields and has written more than 80 articles that have been published on various online websites. Arnett also reviews and edits newsletters for the American Postal Workers Union.